So I took the time to watch the first two episodes of the new Fox television show called "Almost Human". I went into the show knowing next to nothing about it; the only information I did know was what was gained from the TV spots put on during my football games. From what I saw, it looked like they sunk a lot of money into production and appeal, and normally under those circumstances, the story and acting tend to resemble what I leave in the bathroom after too much spicy food. I have a policy about judging a show, movie, or book; if I don't experience it first hand, I have no right to judge it. So, in that spirit, I watched the Pilot, and the second episode they aired the next day. Like most shows of its kind, it started off with a narrative, and subsequent writing, explaining the universe the show is set in. Several years into the future, in a time of artificial intelligence, and android-like robots, large rising crime rates, and overall disarray of the streets. After the narrative, it lept right into a huge action scene, very loud, very fast, and very hard hitting. 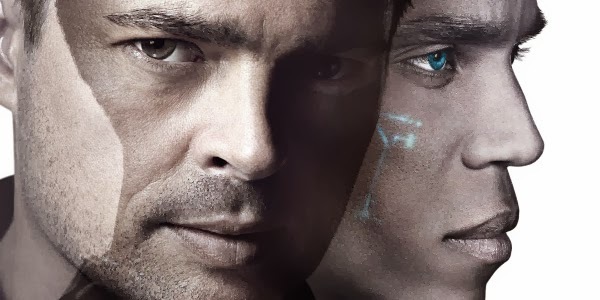 The opening sequence was delivered in a way to have explained the mindset of the show's main character, Detective John Kennex (Karl Urban), and his subsequent mistrust of androids. The story immediately sounded a bit to me like i, Robot, but I can forgive the similarity, because I also wouldn't trust A.I. very much, but then again, they always seem to destroy (or try to) humanity in the movies. So far, in what I have seen, I am actually pretty impressed by the writing and the acting, the one thing I thought would suffer when all the money went into the special effects budget. Karl Urban brings us an impressive performance, but he's always been quite entertaining in the roles I have seen him in. Whether it be Lord of the Rings, Dredd, or Star Trek, he has always seemed to hit it on the nose. He is a unique actor, and I look forward to seeing what else he throws his hat into. They did hit pretty fast on some cop drama stereotypes. You have the meat head moron cop role filled, and you have the too smart for how hot she is chick cop role filled. If this is as far into the future as they want us to believe, why are the cars still using gas? And there is no way that anyone under the age of 60 would be listening to New Wave 80's music, sorry, it's not going to turn into classical music. I am a little impressed with the criminal entity they are up against. They are sophisticated and smart, but the cops were able to foil their first big criminal event a bit too easily for my taste, but it wasn't a bad story. Overall, out of ten for first impressions, I would give this show a strong eight. They did pretty good and if they keep this up, they will have quite the show. As long as Fox doesn't pull a Fox, and cancel it after it's gotten good, I hope to see this one stick around a while to mature.